But this game had more than just great graphics. 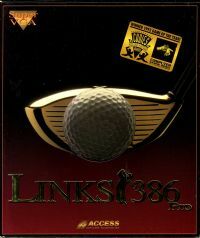 The sound quality was outstanding: the whoosh of the club, the smack of the ball, the glorious sound of the ball entering the cup, all this and more enhanced the experience of and the illusion of actually “being there” on the links. Players could mulligan their shots (but it would show up on their scorecard). You could preview the course and analyze the grade of the shot. You could even split the screen to watch the ball coming and going from different angles! So many features added to the enjoyment of the game.